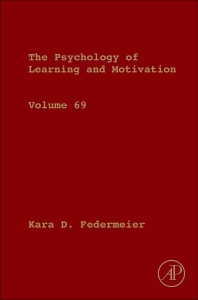 Psychology of Learning and Motivation, Volume 69, the latest release in the Psychology of Learning and Motivation series features empirical and theoretical contributions in cognitive and experimental psychology, ranging from classical and instrumental conditioning, to complex learning and problem-solving. New to this volume are chapters covering Consilience in the Use of Feedback to Promote Learning: A Review of the Literature, Process Models as Theoretical Bridges Between Cognitive and Social Psychology, Forming Salience Maps of the Environment: A Foundation for Motivated Behavior, Enhancing Learning with Hand Gestures: Principles and Practices, Synesthesia and Metaphor, Learning Structure from the World, and more. Additional sections cover Free Energy Principle in Cognitive Maps, The Neural and Behavioral Dynamics of Free Recall, and Roles of Instructions in Action Control: Conditional Automaticity in a Hierarchical Multidimensional Task-Space Representation. Kara D. Federmeier received her Ph.D. in Cognitive Science from the University of California, San Diego. She is a Professor in the Department of Psychology and the Neuroscience Program at the University of Illinois and a full-time faculty member at the Beckman Institute for Advanced Science and Technology, where she leads the Illinois Language and Literacy Initiative and heads the Cognition and Brain Lab. She is also a Past President of the Society for Psychophysiological Research. Her research examines meaning comprehension and memory using human electrophysiological techniques, in combination with behavioral, eyetracking, and other functional imaging and psychophysiological methods. She has been funded by the National Institute on Aging, the Institute of Education Sciences, and the James S. McDonnell Foundation.